In 1987, Universal introduced a new show to the stunt arena. 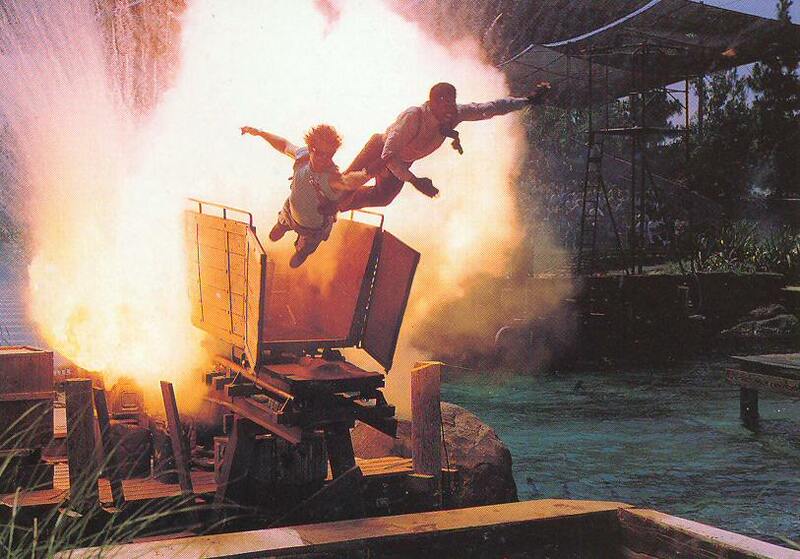 Replacing the A Team Live, the Miami Vice Stunt Spectacular exploded into the scene in a whole setting with a river running in the front of a large Hacienda house. Crockett and Tubbs, the heroes from the TV show are trying to stop a group of smugglers. The show featured an incredible amount of fire along with a lot of mechanical effects. Ride & Show Engineering was called in to provide show action equipment, pyrotechnics and safety devices for the performers. The show was cast by David Draves and used 5 teams of 6 performers. Up to 10 shows were performed a day and teams would alternate, with 3 being “full time” and two called in to replace for vacations and injuries. 6 characters were featured in this: Crockett, Tubbs, the Director and the 3 Smugglers. The show had 3 cuts in the action called by the Director who would explain what we just saw and what is coming up. One very unique stunt involved Crockett and Tubbs running into a large wooden shed. 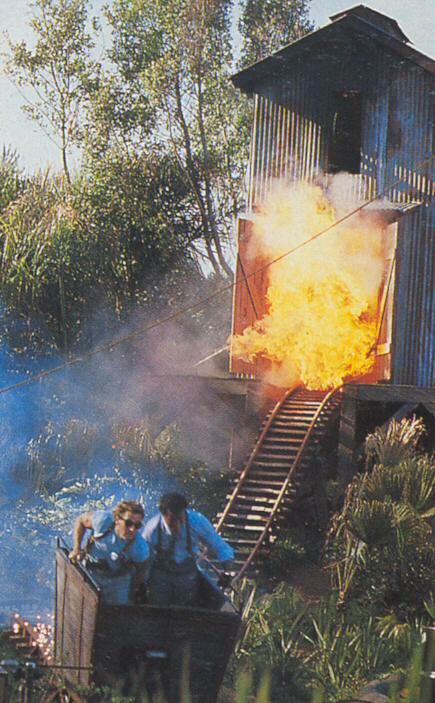 The wooden shed would explode in large fireballs coming out of the wall and roof, which lead to the two stunt men riding a mine car on a track that end in front of the crowd. The car would suddenly stop and as soon as the two were clear of it, it would break and explode in another explosion. This was a timed stunt, as when the car crashed,if the stunt actors were not clear of the car within a fixed time, the fire would not trigger. The wooden shed explodes after the mine cart rolled out with our heroes. The cart has crashed and has just blown up in this picture. The show finale involved a large helicopter mounted on a gig that would lift from behind the Hacienda and shoot at our two heroes. They would fire back and cause the chopper to crash behind the hacienda in a gigantic fireball. Even through it looked like the actor was very close, he actually jumped off the water tower and out of harm’s way before the helicopter crashed. In 1989, Universal Studios Hollywood replaced the Tower of London medieval set on the Back Lot with yet another special effect demonstration, Earthquake. We take a detour through soundstage 50 which is dressed up to look like a Subway station. A few movie props are still visible as the set is being dressed for the next scene. Suddenly, we hear and feel some tremors that start to magnify as we get the feeling that something is wrong. Our tram is mounted on hydraulic shaker tables that are programmed to move and pitch us as if the ground was liquefying and collapsing under us. Suddenly, in a cloud of steam and a shower of spark, a large propane tanker truck break through the ceiling and start sliding toward us. It smash into a cement support column before hitting us and burst into a large fire ball. Flames start rushing from behind the tanker truck and cause a garbage bin and stairwell to explode as well. The truck diesel tank also catches fire next to us. A power pole fall down as well and shoot off even more sparks. 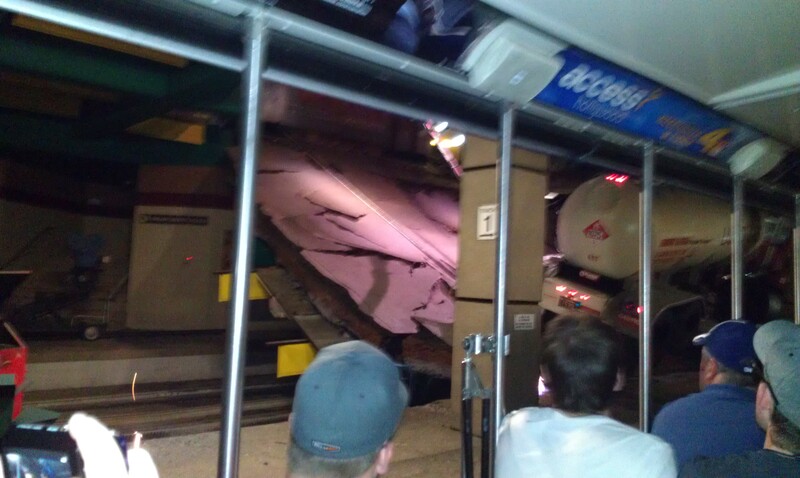 The broken road segment and sliding truck. The truck stop very close to our hapless tram. The main fireball come out from behind the tanker. Fire start running behind the truck. It reach a red dumpster and sets it on fire. After the fire, water! The water main break and a torrent of water rush toward us. It pushes down everything in its path and finally, we realize that it was yet another staged event on the Studio Tour. It is a remarkable set filled with a lot of details and effects, such as an electrical panel opening and seeing bolts of electricity running on the transformer and the elaborate street scenery upstairs where the truck come from. Through the years, a few smaller fire spots and spark machines were removed versus what was present at opening. Also, there never were live actors involved in the regular show, as that was specially staged for a movie and promo video. One cosmetic change was the unfortunate owner of the truck: it was originally “Liqua Flame” and this was changed in the 2000’s to Olvera. 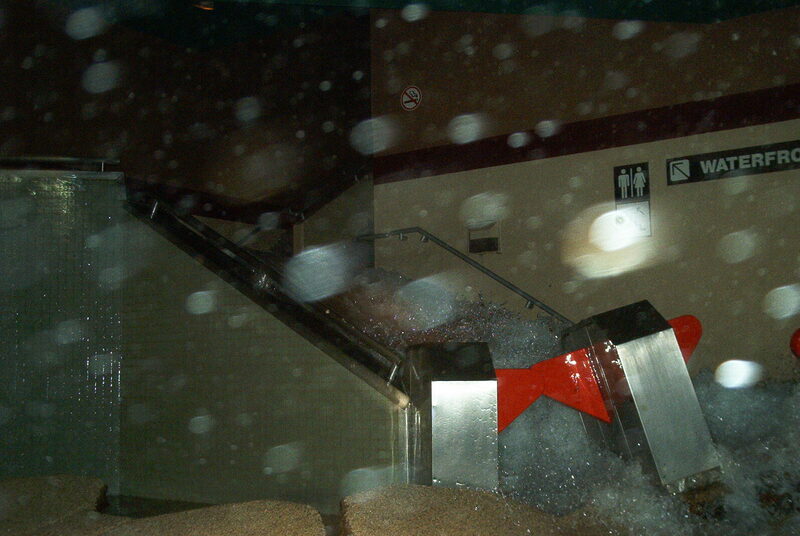 The water rushing down the stairs and pushing the turnstiles toward us. In 1989, Walt Disney World opened its third gate, the Disney MGM Studios. It was originally conceived as a working studio similar to Universal in California that also had a theme park section. Out of the small opening day roster, 3 attractions involved fire. The park major attraction was the nearly 2 hours Backstage Tour. We first stood in line and like at Universal, we boarded specially designed red trams with hydraulic side doors to keep riders inside through the whole experience. 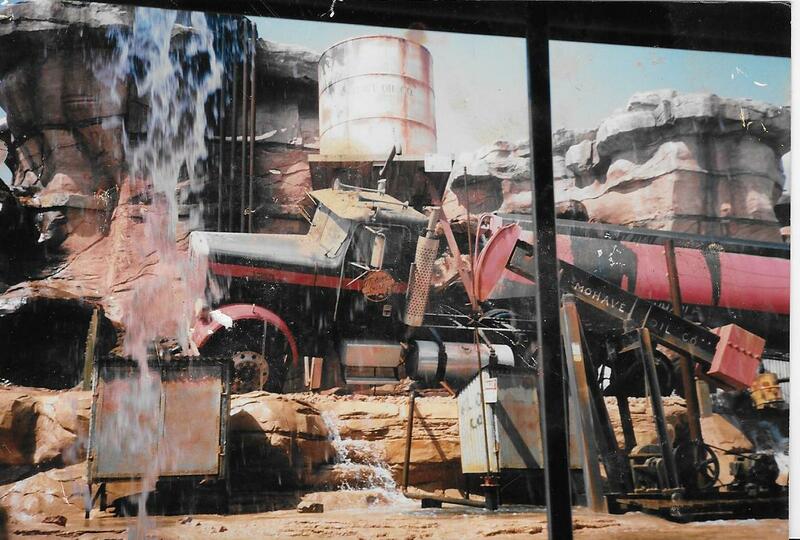 Unlike Universal, there were only two staged event here at first, the Catastrophe Canyon and an encounter with the Toontown Dip Mobile from the hit movie Who Framed Roger Rabbit? 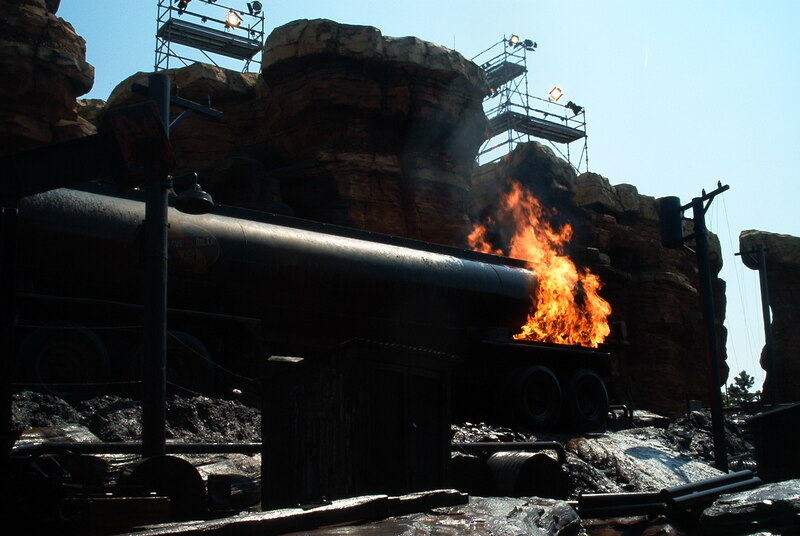 Whereas Earthquake goes the dark and claustrophobic route to scare riders, Catastrophe Canyon uses a large outdoor set where it look like we just rolled into an oil drilling operation of the Mojave Oil Co. The first concept art showed a railroad tanker car a on a rickety bridge. The car would first explode and then the bridge would collapse, seemingly sending the car toward the tram. Now, for the Show Action Equipment portion of the Canyon, Walt Disney Imagineering contracted it out to Sequoia Creative. Sequoia was active at the time and had been founded by Imagineering legend Bob Gurr and two other ex WDI employees. After reviewing the requirements and what WDI intended to pay, Bob Gurr went back to the drawing board and gave the whole show a fresh look. He eventually had a flash of brilliance: what would scare kids more? Old tanker cars you did not see much at the time or the ubiquitous highway tanker truck? So, his proposal went back and got accepted for the current set-up. The Tanker Truck was worn out and good for the scrap yard, so Sequoia purchased it for 3000$ and had it modified. The tires were changed to a heat resistant material and the tractor underside strengthened to be shaken every 3 minutes by power hydraulic cylinders. Next, the trailer was gutted and the wheel carrier rigged to be mounted at the end of a large hydraulic arm. The back 6 or 7 feet section of the tanker side were opened on the bottom and flame throwers installed. The back of the tanker had an opening cut for another large flame thrower and this would be the initial blast. Thus, the way it was set up, there was no obvious flamethrower or pilot light visible from the guests point of view. The propane used in the show is not pure, as it has an additive added to it. The reason for that? It makes the fire very visible and smoky, thus continuing the illusion of an oil field fire. Our tram stop inside this “Hot Set” and the film crew confuse us for the actors, as they start filming! It start with a rain demonstration, where the tour guide explain that shower nozzles are used to project water away from the camera, thus giving the impression the set is being drenched with a downpour. We hear a rumble as the rickety wooden bridge the tram is on start shaking. The water tower next to the large tanker truck also shake and the power poles swing around, getting dangerously close to the fuel truck. The power transformer on the pole start short circuiting and the sparks ignite the fuel truck. The end of the truck burst into flame and it cause an oil pump to the right to explode as well. The earthquake cause a safety torch to sway dangerously close to a large oil tank on the left. It causes that oil tank to blow up and split open. Steel pipes going up to the main oil reserve at the top catch fire and it finishes with a giant fireball. We then hear the truck horn going off as a giant wave start running down the wall of the canyon and push the truck toward us. The truck tractor is mounted on an hydraulic lift that tilt it to the side and the trailer is attached to a large wheeled hydraulic arm that pushes it toward us. Water tanks over the tram also open and send a wall of water in front of us. It is finally over and the tram driver drives us behind the Canyon to see what it look like from backstage. It is a beautiful set, but it does feel empty, as none of the fire effects are really close to the passengers. Also, what I mentioned about the fire damage to the set is very severe here, as the show will sometime happen every 3 to 4 minutes, which does not let the props cool down from the heat. Eventually the illusion is broken due to the already damaged truck and tanks when we roll in. One fire effect was removed after the first year and that was a burning torch near the left oil tank. 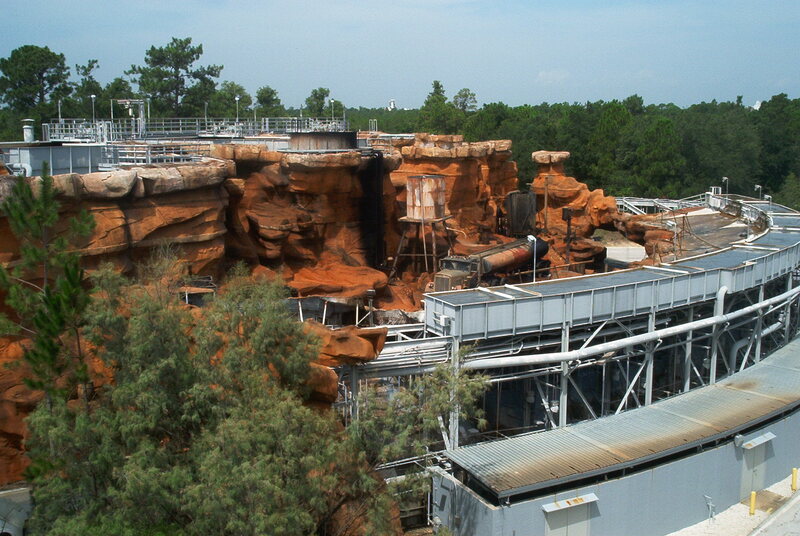 Catastrophe Canyon seen from above. The show has just reset in this picture and we can see the full tanks of water. Everything is on fire at this point. The water effects are going on in this picture. The fire has been put out and the overhead tanks are pouring down in front of the tram. The top oil tank fire on the Paris Catastrophe Canyon. 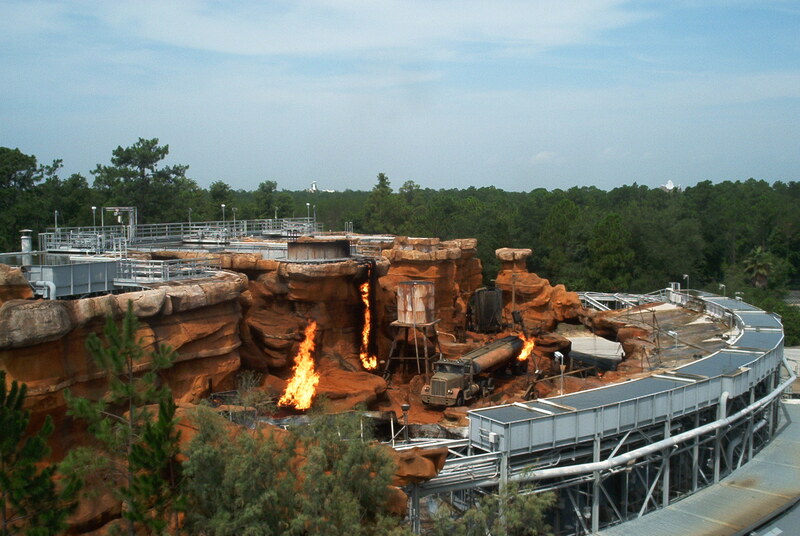 The truck fire on the Catastrophe Canyon. The largest explosion. This was shot in 1989 two months after the park opened. 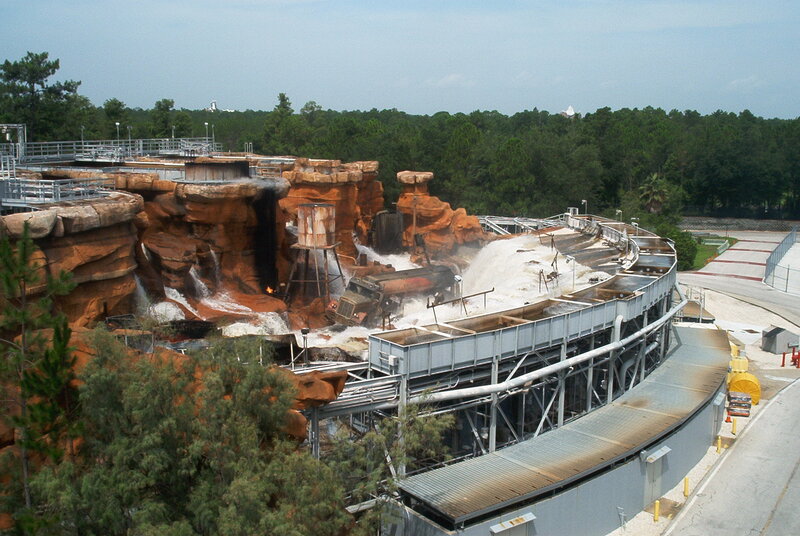 After the tram portion of the tour, guests could take a break and then proceed to the special effect water tank. As part of a demonstration using volunteers, weather, water and fire effects were demonstrated. In this case, the fire portion consisted of two model Destroyer war boats that were set on fire on the water and through the camera’s lens, it appeared as if the real thing was ablaze. What became the Backlot Tour in 1996 closed down on September 27th, 2014. 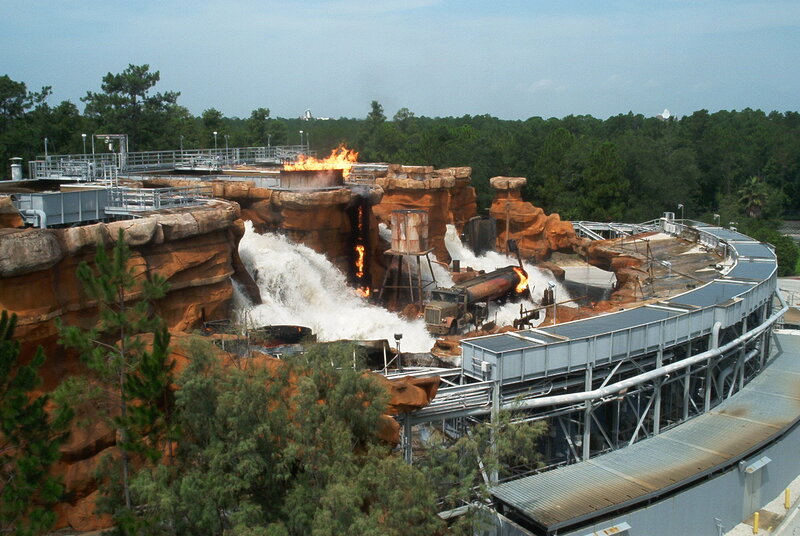 A modified version of Catastrophe Canyon still operates at the Walt Disney Studios Paris (Chessy, France). The Paris Catastrophe Canyon at night. Approaching the Paris Catastrophe Canyon. The oil pump. 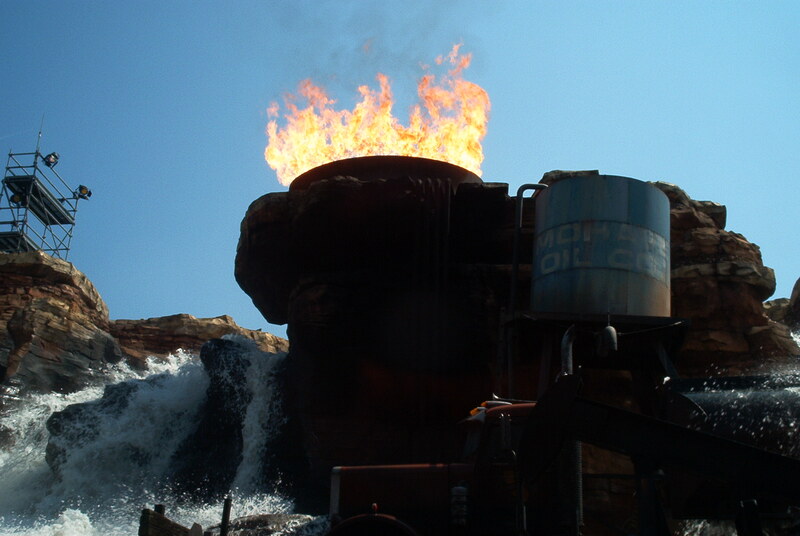 At the Walt Disney Studios, the oil pump does not work continually and is only turned on when the show starts. The truck is a different model and the tanker is newer. The back of the truck caught fire. The truck post Tidal Wave. 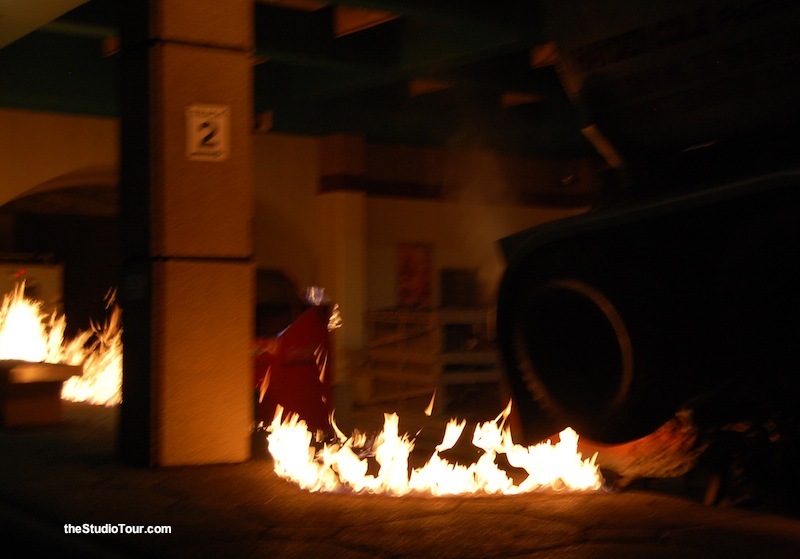 The second attraction to use fire at the Disney MGM Studios was the Great Movie Ride. Built as a large scale dark ride that celebrates the history of cinema, it uses large trams that travel in pair for some show scenes. The scene that interests us is when the Cowboy hijacks our tram. We roll around in the middle of a bank robbery in the old west and the robber happens to see us. He views our tram as his escape vehicle and so, he blows up the bank using a bundle of dynamite that is then thrown the doors he just came from. As the sheriff, the robber and his accomplice trade gun fire, the bank blows up in large flames. This scene is exclusive to the front tram when loading, as the second tram will just see the sheriff and the accomplice. 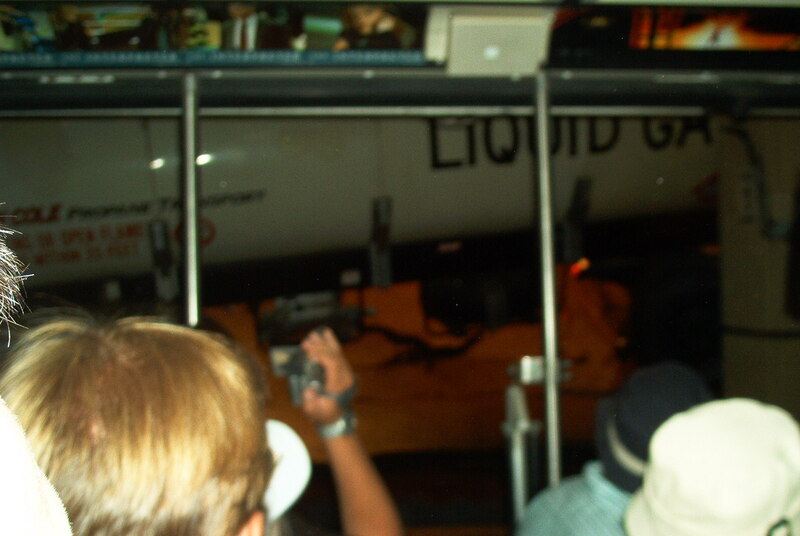 This entry was posted in Special effect and tagged Backstage Studio Tour, Catastrophe Canyon, David Draves, Disney MGM Studios, fire, Indiana Jones, Miami Vice, Paris Catastrophe Canyon, Studio Tour, Stunt Show, tanker truck, Universal Studios Hollywood, Walt Disney Imagineering. Bookmark the permalink.